NEW YORK, Feb. 12, 2019 /PRNewswire/ -- Bluerock Capital Markets (BCM) announced today that after reporting back-to-back months of record equity capital raise of its sponsored investment programs of $79 million in November and $81 million in December, and record full year sales in 2018 of $766 million (up 27% from 2017), equity inflows surged 50% in January to nearly $120 million. Based on industry data, BCM's 2018 sales through independent broker dealers rank among the top 3 in a crowded sponsor field, including the recent entrance of several high-profile institutional alternative sponsors†. "Our well-documented ascension among the top capital raising sponsors in the industry is clear corroboration that broker dealers and investment advisors believe Bluerock is providing products and solutions that fit with today's investor needs and more importantly that we have an established track record of consistently delivering on our stated investment objectives during a very volatile period", said Jeffrey S. Schwaber, CEO of Bluerock Capital Markets1. 1 Bluerock Total Income+ Real Estate Fund's primary investment objective is to generate current income while secondarily seeking long-term capital appreciation with low to moderate volatility and low correlation to the broader markets. 2018 Total Returns and standard deviations: TIPRX, no load: 7.07%, 0.92%; S&P 500: -4.38%, 20.54%; MSCI U.S. REIT Index: -4.57%; 19.85% Bloomberg Barclays U.S. Aggregate Bond Index: 0.01%, 3.37%. 2 Adjusted Funds From Operations (AFFO) as reported in most recent BRG filing 10-Q as of Q3 2018. While certain BRG Warrants are expected to be "in the money" in early 2019 based on the current trading price of BRG's class A common stock, there can be no assurance that the BRG common stock price will continue to exceed the applicable BRG Warrant exercise price and/or remain "in the money". Bluerock Capital Markets is not providing advice as to whether holder should exercise the BRG Warrants or not. The performance data quoted here represents past performance. Current performance may be lower or higher than the performance data quoted above. Investment return and principal value will fluctuate, so that shares, when redeemed, may be worth more or less than their original cost. Past performance is no guarantee of future results. A Fund's performance, especially for very short periods of time, should not be the sole factor in making your investment decisions. For performance data current to the most recent month end, please call toll free 844-819-8287. The total annual operating expense ratio for A and I shares, gross of any fee waivers or expense reimbursements, is 2.43% and 2.22%, respectively. The performance data quoted herein represents past performance. Current performance may be lower or higher than the performance data quoted above. Investment return and principal value will fluctuate, so that shares, when redeemed, may be worth more or less than their original cost. Past performance is no guarantee of future results. 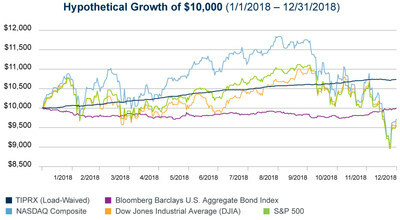 The Fund's investment advisor has contractually agreed to reduce its fees and/or absorb expenses of the fund, at least until January 31, 2020, to ensure that the net annual fund operating expenses for A and I shares will not exceed 1.95% and 1.70%, respectively, subject to possible recoupment from the Fund in future years. Results shown reflect the full fee waiver, without which the results could have been lower. A Fund's performance, especially for very short periods of time, should not be the sole factor in making your investment decisions. Bluerock Total Income+ Real Estate Fund offers individual investors access to a portfolio of institutional real estate securities managed by top-ranked fund managers with more than $181 Billion of underlying gross asset value and 3,400+ properties. The Fund's primary investment objective is to generate current income while secondarily seeking long-term capital appreciation with low to moderate volatility and low correlation to the broader markets. The Fund utilizes an exclusive partnership with Mercer Investment Management, Inc., the world's leading advisor to endowments, pension funds, sovereign wealth funds and family offices globally, with over 3,300 clients worldwide, and $11 trillion in assets under advisement. Bluerock Residential Growth REIT, Inc. is a real estate investment trust that focuses on developing and acquiring a diversified portfolio of institutional-quality highly amenitized live/work/play apartment communities in demographically attractive knowledge economy growth markets to appeal to the renter by choice. BRG's objective is to generate value through off-market/relationship-based transactions and, at the asset level, through value add improvements to properties and operations. BRG reports assets in excess of $1.9 billion and more than 13,500 apartment units. BRG is included in the Russell 2000 and Russell 3000 Indexes. BRG has elected to be taxed as a real estate investment trust (REIT) for U.S. federal income tax purposes. Investing in the Bluerock Total Income+ Real Estate Fund involves risks, including the loss of principal. The Fund intends to make investments in multiple real estate securities that may subject the Fund to additional fees and expenses, including management and performance fees, which could negatively affect returns and could expose the Fund to additional risk, including lack of control, as further described in the prospectus. The Fund's distribution policy is to make quarterly distributions to shareholders. The level of quarterly distributions (including any return of capital) is not fixed and this distribution policy is subject to change. Shareholders should not assume that the source of a distribution from the Fund is net profit. A portion of the distributions consist of a return of capital based on the character of the distributions received from the underlying holdings, primarily Real Estate Investment Trusts. The final determination of the source and tax characteristics of all distributions will be made after the end of each year. Shareholders should note that return of capital will reduce the tax basis of their shares and potentially increase the taxable gain, if any, upon disposition of their shares. There is no assurance that the Company will continue to declare distributions or that they will continue at these rates. There can be no assurance that any investment will be effective in achieving the Fund's investment objectives, delivering positive returns or avoiding losses. The discussion of BRG securities herein relates solely to BRG's Series B Preferred Stock and Warrants, non-traded securities of BRG which have not been listed on any national exchange. The risks and rewards of investing in the Series B Preferred Shares are separate and distinct from an investment in BRG's common stock listed on the NYSE American. This is neither an offer to sell nor a solicitation of an offer to buy any securities. An offering is made only by the prospectus. Any prospective investor must be read the prospectus in order to understand fully all of the implications and risks of the Series B Preferred Shares.